The Spanish Champs Story Book collection contains four of the most popular children's Spanish stories from the Spanish Champs Level 1 program. Each story is beautifully illustrated and reinforces basic Spanish from the Spanish Champs (or any beginning) program. This volume is great for both home and classroom. ¿Dónde están los pollitos? Where are the Chicks? Eva has colored balloons and meets up with her friend David who is sad. Feelings, colors and verbs. 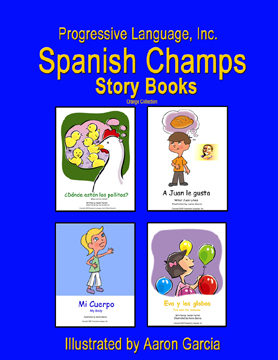 Click the button below to add the Spanish Champs Story Books to your wish list.